by Dave from The Longest Way Home ~ July 12th, 2011. Updated on September 21st, 2013. Published in: Travel blog » Thailand. 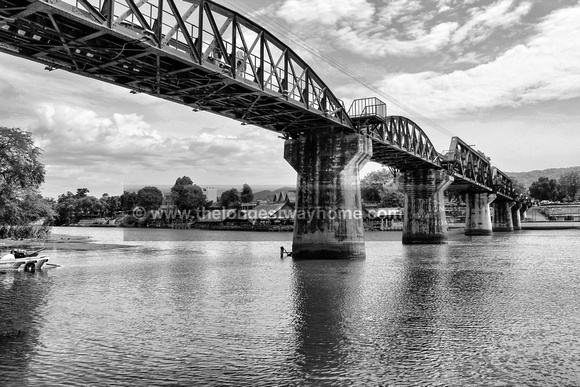 The Bridge on the River Kwai … or is it river Mae Klong? 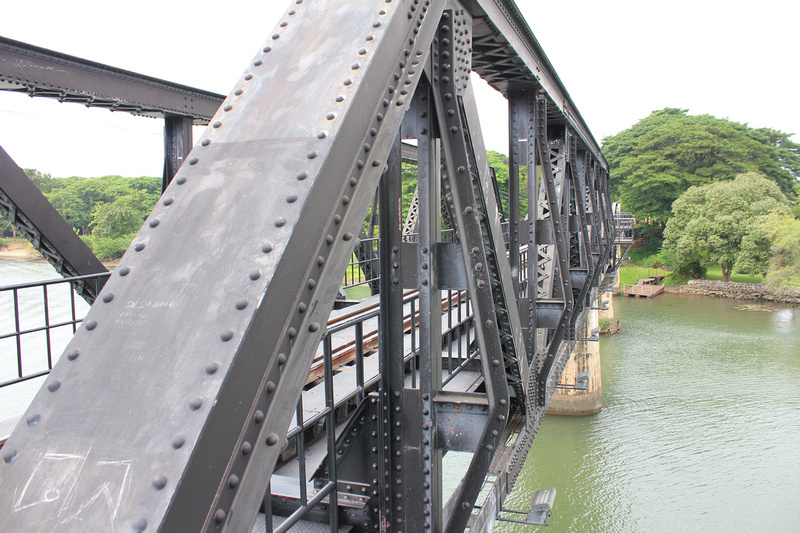 The Bridge on the River Kwai sits in infamy as a classic world war two movie. Based on a fictional book by French writer Pierre Boulle, it features the construction of the Burma Railway between 1942-43. Dig deeper into this films own history, and you’ll see it has quite a bit of controversy in its own right. But, that is not why I am here. Temporarily based along Bangkok’s MRT/BTS rail lines I really wanted a break from the hot humid city, and rail seemed the best way to do this. Not having plans to travel “all” of Thailand, I looked for a place a little out, but not too far. Kanchanaburi seemed like an ideal place. 5km from the “Bridge on the river Kwai”, the town looked peaceful, idyllic, and not so far removed from civilisation. What’s more, there’s a special weekend tourist train that leaves from Bangkok’s main train station Hualamphong at a cost of 120 Bhat. It saved me the time and trouble making it over to the second station at Thonburi, which seems to have moved. There are also a bevy of tourist buses making the route everyday. Special mention has to go to the Thai people on this great weekend train. There were very few international tourists here. Everyone seemed to be from Thailand. And, they really were exceptionally nice. The conductor was a lovely old smiley man in a brown uniform that marched up and down with a megaphone and had everyone singing and joking along with him. Barely a word of English, yet still his grin was enough entertainment for the hot train ride.If you had a birthday, you were made the center of attention one way or another. A stop at Pathom Chedi for breakfast was unnecessary, but in hindsight if I’d known about it I wouldn’t be writing this with an almighty pain in my stomach. Passing over a high cliff side rickety rail bridge, don’t look down! I thought I’d seen the last of my bad bridges in Nepal. But the Bangkok to Kanchanaburi route passes over a rocky cliff side face where there’s a bridge set made from wooden girders. The train slows to about 5mph and eeks along this corner of rickety old wooden beams. Meanwhile, everyone in the train carriages rushes to the windows for a glimpse of this uneasy crossing. But, as the Thai’s do, everyone still smiles. By 9.50am we were at the bridge. What’s the real Bridge on the River Kwai like? Black painted iron and concrete with some wooden girders, it’s a well-kept rail bridge that stretches over a green looking river. On either side they have made some small walkways for people to cross over. Each with an area away from the rail so passing trains (2 a day) can ride by. I walked the old rail bridge and somehow didn’t get the feeling I was seeing anything so special. A strange thing for me as I like WWII history. Maybe it was because it has been well documented already, or maybe because my stomach was still in a tight rebellion over breakfast. At the end of the bridge was a lone Thai man on a small guitar playing Simon & Garfunkel’s “Bridge over Troubled Water”. Tourists walked past, each of us trying to take a photograph of the famous bridge … a famous bridge over a river that once upon a time really didn’t exist! This famous bridge, is really only famous due to the movie. One that the book’s author, French writer Pierre Boulle, had based here as he presumed the river Kwai ran north of Kanchanaburi town. He was wrong; it was the river Mae Klong. And so this is actually “The Bridge on the River Mae Klong”. In the 1960’s during the release of the Blockbuster movie “The Bridge on the River Kwai”, the river Mae Klong was renamed Khwae Yai River or River Kwai. Purely to associate it with the movie, and the droves of tourists heading there. Add to all this the fact that the movie was actually shot in Sri Lanka, and it really makes for a bizarre history in its own right. But, in reality there is a very chilling real history to this railway line. In 1942, Japanese forces had invaded Burma via Thailand and taken the then colony from the British. To keep supplies running to the area, and avoid their disadvantage at sea, the Japanese started the railway project in June 1942. Originally a concept of the British in the early 20th century, it was abandoned due to the harsh and difficult terrain. The Japanese had no intention to let this stop them. Approximately 90,000 Asian laborers and 16,000 Allied POWs died as a direct result of the project. The famous movie came under heavy criticism as many POWs stated that their treatment along this railway was far more brutal than the film told. The producers stated that they would never have been allowed to show such treatment by the censors of that time. A bridge over a river that never was. A movie that wasn’t able to tell the whole the truth. And a train that still runs today. I could tear it all apart. But, that’s history, one way or another. In the movie there’s a scene with a famous song: “Colonel Bogey’s March” or “Bridge on the River Kwai Theme”. I use it when I am frustrated in certain circumstances. No one in East Asia seems to really “get it”. You can listen to the famous tune on this youtube video from the movie a bridge over river Kwai. At the time the lyrics were also deemed too vulgar for the film, so they just whistled the tune. Much like the real meaning of the song, it made many people laugh as it was bypassing the censors yet still being blatant with its meaning. What’s more, it made some people, very proud in hearing it during the honorable, inevitable, march scene. There are several variants of the wording. Indeed, Wikipedia has a whole article dedicated to the lyrics (source). Whichever one you prefer, the result is the same. No matter how frustrated one gets, or how bad things can seem. If you get the tune/song, it can work wonders. There are numerous tour buses offering day trips or transport to Kanchanaburi, where the Bridge on the river Kwai is found, via mini van and bus. Via train there is a special weekend tourist train that leaves from Bangkok’s main train station Hualamphong at a cost of approx 130 bhat. The weekend train leaves about 6am and returns at 6pm-7pm from Hualamphong with tickets available in advance. Another option is to take a train from Bangkok’s Thonburi station. Would you like to take this train trip? Read my full guide on taking the weekend train to the Bridge over the river Kwai. Staying in Thailand or Kanchanaburi? Try my hotel search, it’s easy, fast and searches all the major hotel sites for the best prices! Really enjoyed this, a lot of information there to digest. Never knew they’d renamed the river. I’d laugh, but the French guy got it wrong in the first place! Informative, humorous and a good read. Does it look like they have done much repair work to the bridge over the years? There’s some vandalism, but not much. For main repairs the bridge looks to be in good order compared to many others nearby. Glad you’ve made it to Kanchanaburi! The place has become quite memorable for me… for good and bad reasons. There is a temple/ cave near the Kra Sae train station, where people can only walk on the wooden steep rail tracks to access it so the train slows down. There are no safety railings unlike the ones built on the River Kwai bridge so the train has to be really slow, in case there are people walking to and from the temple/ cave. You shouldn’t miss the Hellfire Pass Museum. Get there early so you can walk way past the Konyu cutting. Make sure to get one of those audio guides… I still feel goosebumps just remembering the narration of surviving POWs who worked and suffered to built it. Definitely one of the best WWII museums I have visited. Can’t wait to read more of your travels to Kanchanaburi. Keep well! I’ll be going back to Kanchanaburi, as there’s a lot to do there. Unfortunately I got food poisoning, (really not taking to Thai food) so had to cut things short. But yes, it’s a good excuse not to see everything so I can go back. Hellfire Pass is something I would like to see! Beautiful photograph at the top. How scenic it looks today compared to what it must have looked when it was first built. Thailand then joined the side of the allies (rather like Italy did in Europe). Thanks for the additional information, some interesting things there. Hidden histories are always fascinating. Even something like this bridge, so many people don’t even realize the movie was shot in Sri Lanka? Let alone the death toll there. It’s a bit of touristy thing these days. But away from the bridge and you can pick up the real history of what went on there quite easily. Well it is not so simple as that. You mention their agreement with Japan, but fail to add that they signed a mutual Non-Aggression Pact with the UK at the same time. It was not at all their intent to fight the British Empire, as you suggest. Rather, they were attempting to be neutral except regarding France, and their agreement with Japan was intended to allow them to fight the French to their east. Obviously that was naive, and Japan exercised no restraint in using Thailand to attack the British. Thailand, having realized that Japan was not willing to respect their neutrality in the non-French parts of the war, and being forced to pick a side, chose the Allies as soon as they had a chance. Note also that Thailand is the only country in SE Asia that was never a European colony. Playing the British against the French was a major part of that success. WWII changed all of that. It is mistaken to ignore all of that and imply that they were siding with Japan against Britain. Oh the picture of the train crossing the rickety cliff is amazing! I can’t imagine how I’d feel if I were in the train.. definitely not holding a camera! :) Great post Dave! Long time reader. I was wondering if you would head over here, and made my bets that you would. Very glad you did to. Excellent article as I’ve come to expect. Looking forward to the next. Thanks Jeremy, the next post is a bit different. But this is a journal, so it should be. Liked this a lot. Hoping to get to the river Kwai next year and learning about it’s past like this is quite incredible. I knew about the movie being shot in Sri Lanka, but never about them renaming the entire river! Amazing what people will do for fame eh! It’s crazy how many people died! That’s hard to fathom. Thanks for sharing a bit of history on the Bridge on the River Kwai. 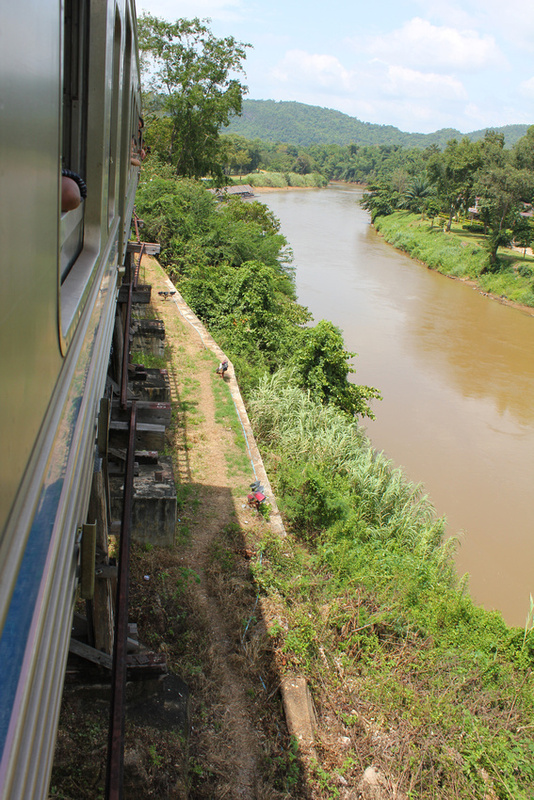 We traveled northern Thailand by train and considered heading there, but it was out of our way. Looks like the destination is worth a stop. Well, it’s really just a bridge. But the area around it has a lot of history if you like that sort of stuff. But, yes, many people did die here. I’ll be covering that tomorrow. Thanks for this post. I have visited the Bridge and Hellfire Pass but did not realise the error over the river’s name, or the fact that the idea for the railway was originally a British idea so thanks for the new insights! I was really moved by both the bridge and Hellfire pass and it made me realise how little I knew about the scale of the Second World War. We studied the war in school, of course, but coming from Britain it was very heavily based around Britain and Germany. I remember being confused as to where the Japanese and Americans fit in as our teachers never really explained it beyond the fact that Pearl Harbor was bombed and the US retaliated with Hiroshima. I had no idea that the whole of SE Asia was threatened by the Japanese at the time. I would definitely recommend a visit to Kanchanaburi too, it’s a really lovely place. No worries, glad to see you made it there. You’re right about how history is taught. It varies from different regions around the world. When I was in The Philippines I was asking about the Japanese when they were there, and people knew about it. And, they knew about the Americans when they were there. But, very, very few people knew about Germany?! Or the Nazi U-boats there were in the region, which I wrote about in Penang. So yes, history is indeed taught on a regional basis. Which is a shame when it comes to events that effect the world. Outside that, yes, Kanchanaburi is indeed a lovely place! I recalled crossing over the Bridge of the River Kwai in 1997 and I didn’t realise that it was the Mae Klong river until today, so much for Hollywood movies injection and I just followed along with it. Could still remember the history and importance of this Death Railway that is actually further up and inside, whereby many soldiers were lost to build this Death Railway. 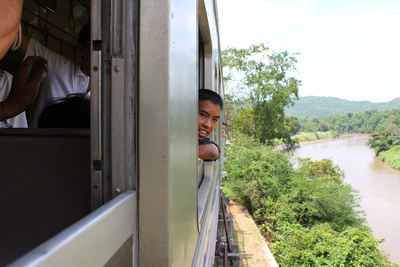 I would never forget Kanchanaburi and would love to ride this railway train to there for photography and revisiting Kanchanaburi again! It’s strange how names were changed for the sake of tourism. My only hope is that the Death Railway remains the focus on peoples minds when they visit, rather than the movie. Glad to hear you were there in 1997! !